One of the consistently thrilling aspects of sitting across from Dan Morgenstern is the immediate knowledge that here is a man who is both here now and was there then, his perceptions gentle but also sharp-edged. A word about “immediacy.” I have written at length about John Hammond, read his memoir, read the biography of him, seen him on television, heard him interviewed, and from that collection of facts, stories, impressions I’ve made my own complex portrait of a man who was both immensely generous and intuitive, the man to whom we owe so much good music, from Garland Wilson to the last Buck Clayton Jam Sessions. I also grapple with the man who could turn cruel when not obeyed, the man who grew tired of formerly-admired artists and worked against them. So my mental portrait is complex, ambiguous, and shifting. I found Dan’s portrait of Booker Ervin — Texas tenor and Mingus-associate — particularly touching. We met again just a few weeks ago in December 2017, and spoke of some famous “bebop and beyond” sages, including Bird, Tadd Dameron, and Dan’s rather famous neighbor and friend Miles Dewey Davis. More to come, and we bless Mr. Morgenstern for being himself so deeply. Thirty years ago, I would have defined “rock and rye” musically — as a hot riff number written by Jimmy Mundy for the 1934 Earl Hines band. Then I read a Whitney Balliett profile of Helen Humes, who was then appearing at The Cookery, Barney Josephson’s Greenwich Village Seventies evocation of Cafe Society. 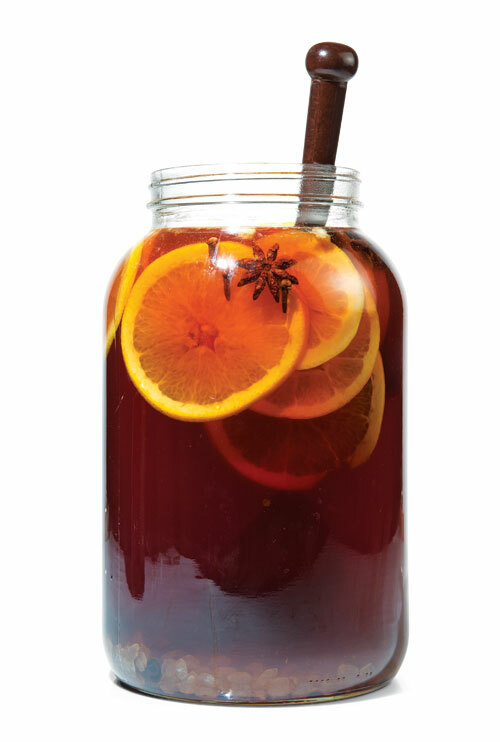 In the profile, Josephson teases Humes that she has to have a drink of rock and rye, that he bought a whole case for her, and she had hardly had any. I filed that away in the cerebral spot reserved for Information You Find Fascinating But Will Never Have A Chance To Offer Because No One Else Really Is Interested In It. At the November 2014 San Diego Jazz Fest, pianist-philosopher Ray Skjelbred — who admires Hines greatly and knew him in his later years — called the tune, and the other members of his ad hoc quartet fell right in. They are Marc Caparone, cornet; Beau Sample, string bass; Hal Smith, drums. But perhaps you’d like to fix yourself a drink before the music starts? I learned that rock and rye was a cocktail in a bottle, a mixture of rye whiskey and rock candy (to take the edge off the whiskey) sometimes also served with lemon and herbs. I imagine that it might have been not only delicious but necessary with Prohibition “rye” whose origins might have been dubious. Even if you choose not to imbibe, the music will have the same elating effect. On the surface, the two performances that follow are very simple, possibly hackneyed: a fast blues with a boogie-woogie underpinning and some Basie riffs at the end, followed by a slow blues. DOWNTOWN CAFE BOOGIE and UPTOWN CAFE BLUES are marvelous syntheses of the music of this century — and they seem vivid in ours as well. In these performances, I hear country blues figures older than records, and Bessie Smith and the singers of the Twenties. I hear Louis Armstrong and Hot Lips Page, the Sunset Cafe and the Reno Club, the piano figures of Cow Cow Davenport and sleek intensity of Charlie Christian. And more. Marvel! Posted in "Thanks A Million", Bliss!, Hotter Than That, Irreplaceable, Jazz Titans, Pay Attention!, Swing You Cats!, The Real Thing, The Things We Love, Wow! Any scrap of evidence showing us more of Newton is welcome. I was delighted to find a Cafe Society program in Terry Trilling-Josephson’s book, CAFE SOCIETY — especially because the program was autographed by Newton, Vic Dickenson, and Eddie Barefield. And a Newton signature also appears in the Bob Inman / Ken Vail SWING ERA SCRAPBOOK. Can anyone identify the musicians in the picture above? At one point Flip Phillips played clarinet with Newton, but in 1947, he was already a star. Suggestions, anyone? And I’m still looking for a printable copy of the photograph (late Forties or the early Fifties) of Newton by Weegee. Newton is sitting in the basement of the apartment building of which he was the janitor, playing his trumpet next to the boiler. It’s heartbreaking, a study of a man exiled from “the music business” but with so much to give us. It’s a long time since I got so wrapped up in a book that I didn’t want to stop reading it — but CAFE SOCIETY: THE WRONG PLACE FOR THE RIGHT PEOPLE (Barney Josephson with Terry Trilling-Josephson, Univ. of Illinois Press, 2009) is just that book. Who was Barney Josephson (1902-88)? If he hadn’t worked very hard to make his dreams become reality, we would only know him as a successful businessman: his specialty, stylish shoes. Happily for us, Barney had thoughts beyond Cuban or French heels: a yearning to run a nightclub in New York City, a keen sensitivity to talent, a hatred of social injustice. And CAFE SOCIETY is the book his life and accomplishments deserve. It could have been dull, academic, or third-hand. But it’s a lively memoir of Barney’s life, taken from the tape recordings he made — he was a born raconteur — subtly annotated and expanded by his widow Terry Trilling-Josephson. Josephson had the good fortune to have John Hammond as his guide, instigator, and occasional arm-twister. When Barney wanted to start a New York night club with music, it was Hammond who urged him to hire the three boogie-woogie pianists, Albert Ammons, Pete Johnson, and Meade Lux Lewis, the blues singer Big Joe Turner, and Billie Holiday. 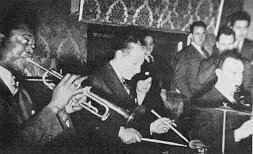 Cafe Society is remarkable for the improvisers who played there: Teddy Wilson with a band including Joe Thomas, Emmett Berry, or Bill Coleman; Benny Morton; Ed Hall or Jimmy Hamilton; Sidney Catlett. 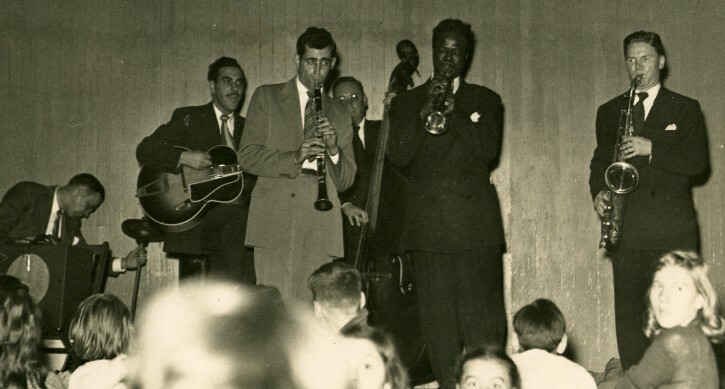 Frank Newton with Sonny White, Kenneth Hollon, Tab Smith, Eddie Dougherty, Johnny Williams. Ed Hall with Mouse Randolph and Henderson Chambers. Ellis Larkins with Bill Coleman and Al Hall. Later on, at the Cookery, Teddy Wilson, Mary Lou Williams. Josephson brought back Helen Humes and Alberta Hunter for successful late-life “comebacks.” And it wasn’t simply jazz and popular songs: think of the Revuers (with Judy Holiday and Adolph Green), of Jack Gilford and Zero Mostel, of the now-forgotten Jimmy Savo, all given encouragement and room to develop by Josephson. But this isn’t purely a list of who-sang-what and how they were received, a collection of press clippings and schedules. Josephson was a first-class storyteller with a remarkable memory, and the stories he remembered are priceless. Nowhere else would I have learned that Emmett Berry, when trying to get someone to take a drink, would ask, “Will you have a drink of Doctor Berry’s rootin’ tootin’ oil?” For me, that’s worth the price of the book. Wonderful photographs, too. Billie Holiday, at first not knowing what to do with the lyrics of STRANGE FRUIT when they were handed to her, and showing her displeasure in the most effective non-verbal way when an audience annoyed her. Zero Mostel, always onstage, making life difficult for the man trying to fit him for clothing. Barney’s firing of Carol Channing and his missing a chance to hire Pearl Bailey. Tallulah Bankhead complaining — at high volume — about what she’d encountered in the ladies’ room. Teddy Wilson’s drinking problem, late in his career. The dramatic entanglements of Hazel Scott and Adam Clayton Powell. The amorous hopes of Joe Louis for Lena Horne. Big Joe Turner and the magic bean. Ultimately, the book is delightful for its stories (and the wonderful photographs) and the way Terry Trilling-Josephson has woven recollection and research together. And the book is — on every page — the embodiment of Barney’s achievements and of the deep love he and Terry shared. Not to be missed!